The eighteenth initiation ceremony of Beta of Mississippi was held on April 6, 2018, with 73 students accepting the invitation to membership. 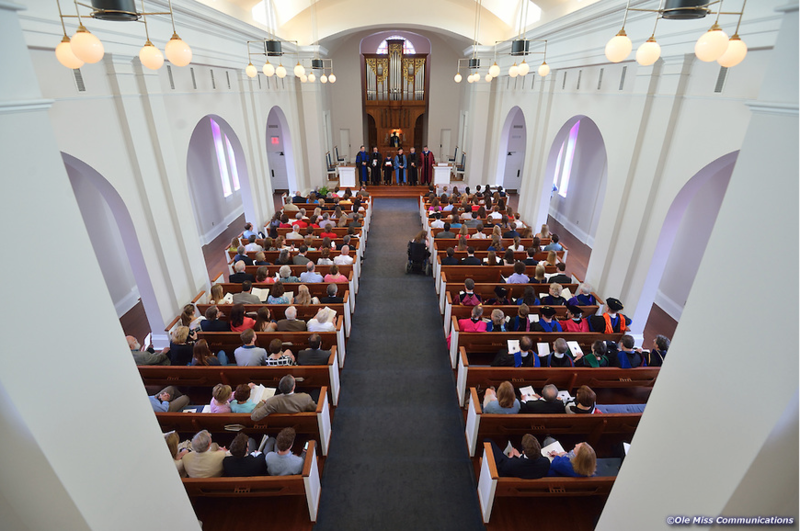 Dr. Donald Dyer, Professor of Modern Languages and Associate Dean for Faculty and Academic Affairs of the College of Liberal Arts, spoke to the initiates and their guests at the afternoon ceremony held in Paris-Yates Chapel. The UM chapter of Phi Beta Kappa is grateful for the support of Chancellor Vitter, Provost Wilkin and College of Liberal Arts Dean Lee Cohen in making the 2018 ceremony a meaningful event for our honored students, their families and their friends. The University of Mississippi chapter of Phi Beta Kappa will host Professor Jamsheed K. Choksy, Distinguished Professor and Chair of Central Eurasian Studies at Indiana University, as the 2018-2019 Phi Beta Kappa Visiting Scholar. Professor Choksy will be on campus October 24-26. His lecture, “The Spread of Islam,” is free and open to the public. It will take place on Thursday, October 25, 5:30 p.m., in room 209 of Bryant Hall on campus. Many thanks to our sponsors who helped make this possible: the UM Chapter of Phi Beta Kappa, the College of Liberal Arts, the Sally McDonnell Barksdale Honors College, the Arch Dalrymple III Department of History, the Department of Philosophy and Religion, — and, of course, the Phi Beta Kappa Society itself for providing us with another outstanding Visiting Scholar.